A common evaluation system is needed urgently to check the declining quality and standard of new lawyers in the country. It is a matter of grave concern that with about 1000 law graduates entering the legal profession every year, there is no common evaluation system to ascertain and ensure their levels of competence. The Bar Council has been advocating a Common Bar Course and Examination (CBE) since the 1980s as a single entry point to the legal profession for both local and foreign law graduates. It is understood that the delay in implementing the CBE is partly due to objections from local universities. But it cannot be gainsaid that the quality and standard of lawyers have also declined significantly since the 1980s. There is a common feeling among senior legal practitioners that there is an “abject absence of rudimentary legal skills” among the new entrants. For example, one senior lawyer related this incident to me involving a senior assistant registrar (SAR) and lawyers for both the plaintiff and defendant. The SAR was tasked to read the judge’s order relating to costs. Both lawyers recorded the amount of costs with interest at the rate of 80%! When the senior lawyer asked his assistant, who was the counsel for the plaintiff, about it, the latter said he did not understand why the SAR had mentioned the interest at 80%. He added that when he checked with the counsel for the defendant; the latter said it was common for the court to grant interest at 80%, which is, of course, erroneous! Hence, the point is, how could one have walked out of the court without even understanding the court’s order? If the parties were not able to understand the order, then they would also not be able to draft the order later. If what the plaintiff’s counsel had said about the SAR and the other counsel was true, then indeed all the three legally trained officers – SAR and the two lawyers - were indeed half-past-six professionals! It follows that it is not unjustified to require the new entrants to also pass an English Language Qualifying Examination. Whilst we can blame this decline on our education system, we cannot ignore the fact that we are living in an increasingly competitive global environment where international business is transacted primarily in English. It is also in the national interest for us to build up a pool of competent practitioners in international law so that we can put across our nation’s case in international forums and courts, which is made all the more necessary after the Pulau Batu Puteh case before the International Court of Justice. In fact, there were 13,350 practising lawyers in Peninsular Malaysia as of Dec 31 last year, with more than half having obtained their basic law degree overseas. The Legal Profession Act, 1976 (LPA) governs the admission of new entrants from various streams to the legal profession as an advocate and solicitor. To be admitted to the Malaysian Bar, one has to be a “qualified person” as defined in the LPA; attain the age of 18; be of good character and not been adjudicated bankrupt or convicted of any offence; be a citizen or permanent resident of Malaysia; have served nine months of pupillage under a lawyer of at least seven years’ experience; and have passed, or be exempted from, the Bahasa Malaysia Qualifying Examination. Three tables containing the relevant information of the legal practitioners and their qualifications have been provided, and let me expound on it a little. United Kingdom* London University (External) LL.B (with at least Second Class (Lower) Honours) to be completed within seven years from Intermediate exams. *A UK law graduate not from these approved institutions can still be admitted here if he has been admitted as either a barrister or solicitor in England or a barrister in Ireland. ** This does not apply to graduates qualified before May 1, 1999 or enrolled in the respective universities on or before April 30, 1998 and eligible to be admitted as a barrister or solicitor in the state in which the university is situated, that is, they need not do the CLP exams again. After May 1, 1999, the graduates are required to sit and pass the CLP exams and it does not matter if they have already been admitted as barristers or solicitors there. Source: Legal Profession Qualifying Board. > The qualifications, except for graduates of Universiti Malaya, National University of Singapore and barristers of England, are determined from time to time by the Legal Profession Qualifying Board (Qualifying Board) which is chaired by the Attorney-General. Any change to the status of the three aforesaid qualifications can only be made by way of a statutory amendment to the LPA. > The two-year exemption from Certificate in Legal Practice (CLP) examination given to law graduates of Universiti Utara Malaysia (UUM) and Multimedia University (MMU) in 2009 will expire on April 15, unless extended indefinitely or for a further period by the Qualifying Board. *Graduated before May 1, 1999 or before CLP is made mandatory for graduates from Australian and New Zealand universities. **Includes graduates from British universities who are not either barristers or solicitors, and graduates from Australian and New Zealand universities regardless whether they are barristers or solicitors there. 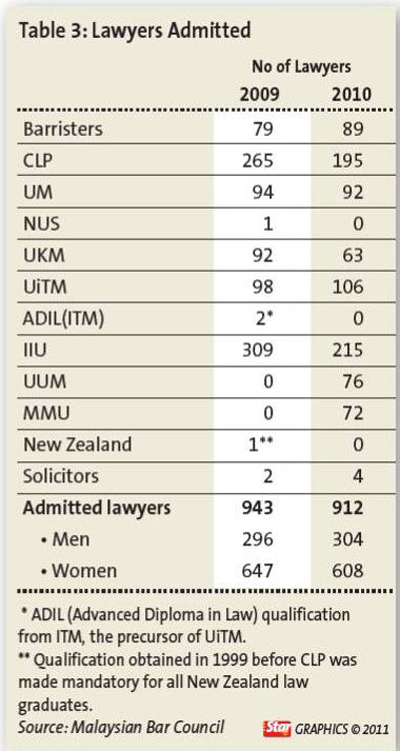 Table 2 particularises the qualifications of the 13,350 lawyers as at Dec 31 last year. It is interesting to note that the International Islamic University is the single university which has produced the largest number of lawyers in Malaysia. > There were 13,346 lawyers; of whom 6,992 and 6,354 are respectively men and women. > In terms of ethnicity, there were 5,190 Malays; 5,025 Chinese; 2,517 Indians; 485 Punjabis and 129 Eurasians and others. > In terms of number of years of practice, there were 1,972 lawyers with one to three years of practice; 2,037 (three to seven years); 2,983 (seven to 12 years); 4,244 (12 to 20 years) and 2,110 lawyers have 20 years of practice or more. > In terms of age, 2,384 lawyers were under 30; 4,847 (31-40); 3,537 (41-50); 1,648 (51-60) and 930 lawyers were aged 60 and above. As regards Table 3 which shows the number of lawyers admitted in 2009 and 2010, it is obvious that women have been busy becoming lawyers in the last two years! It follows that as Malaysian lawyers are coming from so many diverse educational streams, there is an urgent need for uniformity by undertaking a critical review of the entire legal education especially when we are producing a surfeit of lawyers annually. It is for this reason that there have been constant calls for many decades now for the CBE to be implemented as the ultimate sieve in the admission of new practitioners in order to ensure lawyering quality and competency. Further, the CLP course has to be replaced by the CBE because it is too examination oriented, and not practical skills oriented. This is understandable as the CLP was originally designed in 1984 only as a temporary stop-gap measure to assist those Malaysians who were not able to sit for the English Bar Finals Examinations because they failed to obtain at least a Second Class (Lower Division) Honours in their British university law degree. To my mind, law schools should just concentrate on the academic aspect of legal education, and leave the professional training in the form of CBE to the Qualifying Board, Bar Council and the Judicial and Legal Services. Passing the CBE should not just be the pre-requisite for new entrants to the legal profession, but also for new recruits for the Judicial and Legal Services. Pending the implementation of the CBE, the Qualifying Board should also periodically review the teaching and training of law graduates from our local universities. If the standard is not maintained, then the exemption from the CLP examination currently granted to their law graduates should be removed. As regards foreign law graduates, the Qualifying Board has already reduced the number of approved British universities from 66 to just 30, and Australian and New Zealand law graduates are now required to sit and pass the CLP examination even if they have been admitted as barristers or solicitors in New Zealand or any state of Australia. In this regard, the Qualifying Board should be commended for setting up in 2008 an evaluation team headed by the Chief Registrar of the Federal Court which comprised judges, officers from the Attorney General’s Chambers and senior members of the Malaysian Bar to determine if UUM and MMU law graduates should be exempted from the CLP examination. As a result, law graduates from the two universities are now required to undergo a training course on practical skills before they can become “qualified persons” under the LPA even though they are exempted from the CLP exam. This exemption will expire on April 15, and the team would return soon to the universities to undertake a review. In fact, so much has already been said and written in the last 20 years about the urgent need of reforming our decrepit legal education, and we are already sorely lagging behind many Commonwealth countries in this respect. But regrettably, there appears to be a total lack of a sense of urgency on the part of the various stakeholders to come to grips with this unsatisfactory state of affairs which is certainly not in the public interest. *The writer is the head of the Bar Council’s evaluation team appointed by the Qualifying Board to assess the Bachelor of Law degree of UUM and MMU to determine if their graduates should be exempted from the CLP examination. You can follow him on Twitter at www.twitter.com/rogertankm. **I wish to register my appreciation to Chin Oy Sim, Kwan Yin Cheng, Ezane Mansor Obaid and Lilian Chong of the Bar Council Secretariat for gathering and providing me useful information for this article. The above article was first published in The Sunday Star on 6 February 2011. The writer says, "The law degree of the new Singapore Management University has still not been recognised by the Qualifying Board. (Singapore only recognises the law degree of University of Malaya for admission to the Singapore Bar." Note in the following url that it has been shown that the law degree from the Singapore Management University is accepted for admission into the SINGAPORE BAR. This post is highly-discriminatory in nature. It has annoyed me, tremendously. Not to say some of the 5636 local graduates out there. Let me state at the onset that I fully agree with your assertion that it is time the Malaysian Legal Profession moved towards a clear and definitive common entry qualification for all law graduates, irregardless of whether foreign or otherwise, as long as their university is recognised by the LPA. FYI, I was a graduate of a UK law school, and did my CLP in 1999, and was called to the Bar a year later. I however am no longer practicing as a lawyer as the decay in the legal system we have today was already evident to me as a chambering student. However, I would like to submit that your statement above "The Bar Council has been advocating a Common Bar Course and Examination (CBE) since the 1980s as a single entry point to the legal profession for both local and foreign law graduates" is really open to debate. At my Bar Dinner upon being called to the Bar, I had the (mis)fortune to be seated opposite the then Bar Council president, who shall remain unnamed in the interest of common legal sense. I expressed my profound dissatisfaction with the state of affairs with regards the CLP, having in my view, been 'duped' into returning to do what was essentially an extremely subjective and frankly nonsensical examination, on the basis the Bar Council was going to cease to recognise the UK Bar (till this date, this has not taken place). I urged this Bar Council president to look seriously into the matter of a common entry point for all law graduates as it seemed patently unfair to me that foreign graduates (who I assert, receive a superior legal education) should have to sit for an examination that local graduates are exempt from and which there is a lot to suggest, they would not be able to pass ANYWAY. Said Bar Council president proceeded to inform me that the Bar Council had no interest in this matter, and it was an issue for the LPQB, of which he seemed to conveniently forget, the Bar Council has a representative upon. Similarly, after the scandal involving the CLP Director of Examinations, where results were found to have been manipulated, the Bar Council exhibited virtually NO DETERMINATION to actually have the CLP system abolished, and a common entrance exam instituted. Everyone seems to have forgotten that the CLP was instituted as essentially, a 'sympathy' backdoor, to allow students who had not obtained the requisite 2:1 degree needed to enter the Bar Vocational Course in the UK, to qualify to practice. It was designed as a stop-gap measure, but now appears to have used estoppel to justify it's continued existence. I think there is a real question as to whether or not the Bar Council is actually committed to having a common entry point, given the attitude of the Bar Council over the years to this issue, and its lack of determination to carry through with the common entrance examination. And seeing as the bar has now allowed this exam to exist for nearly 25 years now, dealing with the issue now requires formidable political will, which again I wonder if the Bar Council has the energy and stomach to take on. Just read Dr. Zaleha's article. Shocked to see that she made no reference to this article and the writer. Is this the way how a law lecturer should behave and respond without any decent courtesy of mentioning this article? This unethical conduct says a lot about the quality of our local law lecs. Pls add in your vocab something call editing. Delete hatred in your heart esp. towards law lecturers.You'll live happier! It's more unethical to accuse without full facts on how the article was edited. This introduction of CBE has put a dilemma in my head. I'm currently reading law in my second year, at one of the local university called University Sultan Zainal Abidin (i'm sure it'll create a stir in one's head as it's still a new university, however law courses has been introduced since 4-5 years ago). I was told that it was common that local universities are exempted from CLP, however since we are not qualified by the LPQB, I'm really worried on how my future will take me. CLP or BVC would be an expensive option to take since I know I can't afford it. CBE on the other hand looks like a good option however there are things that concern me which i would not want to express it here. If you would Mr Roger Tan, I humbly wish that you can help to fasten the accreditation from LPQB for my LLB. I really wish to work in this profession not only for myself but for my handicap parents too. It's sad and hard to explain to my parents that I will not become a lawyer, as they thought I will once i graduate. Please help me and my peers. Frankly speaking, we are in desperate need of your help. I know it's too much to ask, but please consider this plea. Upon acknowledge the existence of handicap in the bar, it makes me wonder would my prospect master pay me equivalent salary to a qualified lawyer while chambeering since I knew that court could only grant interest at 8% at most unless the rate has been otherwise agreed upon between the parties ? I'm trying to get your points. Nonetheless allow me to explain what I understand. 1) Chambering students are paid allowances. Some firms pay more than the others. Some firms increase the allowances as soon as the pupil got 'short-called' and able to go to court. These allowances sometimes equivalent to a starting salary of a lawyer in a small firm. 2) The court now grant interest at 4% pursuant to the recent amendment in SCR.